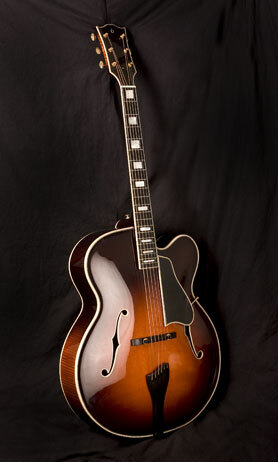 There are mentioned two different variations of archtop guitars on our web pages - Bebop and Historic. Bebop: instruments are made under modern technology with technical knowledge of guitar electrification. Magnetic pickups or special piezo pickups are used. Magnetic pickups are routed in the top plate of guitar. These pickups provide full strong sound. Typical jazz single coil pickup - Gibson P90. Piezo pickups are installed in metal saddles, mostly used system is six separated piezo elements - one for each string. Combination with magnetic pickups is more suitable for jazz players. Piezo pickups, especially in metal saddles, produce too aggressive sound, unusable in jazz music. Bebop models are feedback resistant, designed for bebop, funky, fusion or other modern styles. Steel, chrome or nickel flat wound strings are typically used on these instruments to achieve the real jazz sound. For more modern styles are round wound strings recommended. Very special are double wound strings. Nickel bronze or nickel phosphor bronze wound makes it possible to use it with magnetic pickups without loss of acoustic sound. Historic: instruments are made under traditional technology, developed during the twenties and the thirties. Used mostly for acoustic playing. Magnetic floating or piezo pickups are used if necessary. Floating pickups - single coils or humbuckers - are mounted on pickguard or at the end of the neck, without routing into top plate. Floatings are smaller than standard pickups and it is made under a different technology. For these reasons they produce more acoustic, not so powerful sound. Piezo pickups are mostly installed in a wooden bridge. Broze medium flat wound strings are used to achieving real swing sound. Double wound strings are used when the floating magnetic pickup is installed. The most of models are available in Bebop or Historic version, with or without cutaway.